The number one concern in playing any lottery is how to choose the number combination that will most likely give the player the biggest odd of winning. The methods of choosing the number combination is as varied as the people who play the lottery. Some lottery players choose the number combination based on the important numbers in their lives such as birthdays or anniversaries. Some people use the scientific approach in picking the number combination such as using strategies based on logic or math in the form of tracking and wheeling. However, there is a large group of lottery players who believe that the correlation of stars and planets with their lives by way of the stars’ and planets’ positions or aspects may determine their future, hence the use of astrology in choosing the numbers combination in playing lottery. On the other hand, there are also people who use the ancient art of numerology in choosing their winning number combinations. Numerology is defined as the study of numbers and the occult manner in which they reflect aptitudes and character tendencies as part of the cosmic plan. In numerology, each letter has a corresponding numeric value that provides a related cosmic vibration. For example, the sum of the numbers in a person’s birth date and the sum of value derived from the letters in the name of the same person is believed to have an interrelation of vibrations. The numbers are believed to show a lot about the character, purpose in life, motivation, and talents of the person. Numerology is consulted in determining the best time for major activities or major moves in a person’s life. It is also used as guide in making financial investment, making decisions of who or when to marry, and many other major decisions in a person’s life. December = 12 or 1 + 2 = 3; the day is 23 = 2 + 3 = 5; and 1988 is 1+ 9 + 8 + 8 = 26 or 2 + 6 = 8. The person will have 5 as the primary number and 7 as the secondary number. He can use the numbers 5 and 7, together with other numbers determined by numerology to be good combinations with the primary and secondary numbers. Expert numerologists and astrologers believe that nothing in life is completely random; events are determined by numbers or planets and stars. Find your numbers now and play the lottery. Delma Kinney is set to celebrate his 51st birthday on Dec. 5 with something to celebrate about. He won a $1 million on an instant lottery game. This is the second time he's won a million dollars on an instant game, the first time was in 2008. From the first win, he set aside some money for his three children's college education. This time he will be setting aside a portion to charity. Kenney passed by the Chevron Food Mart at 2959 Campbellton Road in Atlanta and bought cold medicine. While there he also bought the winning Super Millions ticket. 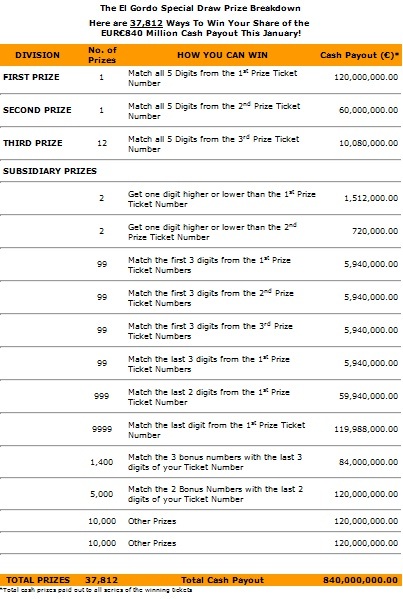 The Super Millions instant game is run by the Georgia Lottery and has cash prizes up to $5 million. After several false reports of lost tickets, the real winners of the $254 Powerball first prize have finally come forward to collect their prize. They arrived at the Connecticut lottery head offices in a stretch limo and wore business suits. It also happens that they are managers of a small boutique aset management firm based in Greenwich, CT.
Greg Skidmore, Brandon Lacoff and Tim Davidson of Belpointe LLC, collected their lump sum winnings to the tune of $108 million after taxes. Belpointe is active in the community not only in terms of property holdings but also in charity work. Jason Kurland, a NY based attorney was also on hand as their spokesperson. "The one thing that we do know is that a significant amount is going to be going to Connecticut charities," he said.